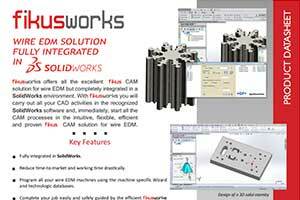 The excellent Fikus CAM solutions for wire EDM completely integrated in the SolidWorks environment. 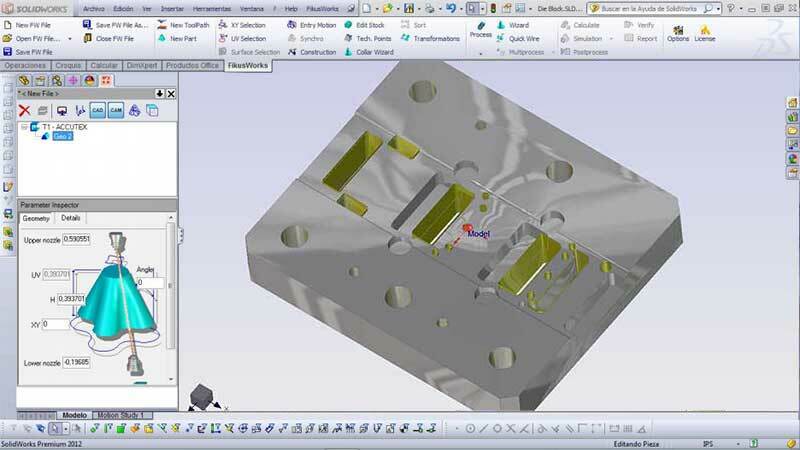 Carry out all your CAD activities in the recognized SolidWorks software and, immediately, start all the CAM processes in the intuitive, flexible, efficient and proven Fikus CAM solution for wire EDM. Reduce time-to-market and working time drastically. Program all your wire EDM machines using the machine specific Wizard and technologic databases. Complete your job easily and safely guided by the efficient FikusWorks step-by-step assistant. 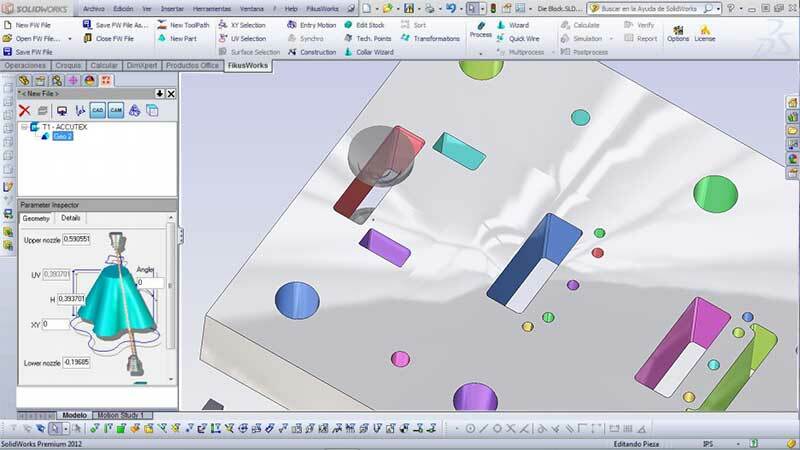 Take advantage of the most advanced wire path calculation algorithms for 2X to 4X cuts. Enjoy the first commercial solution for 4X no-core-cuts. 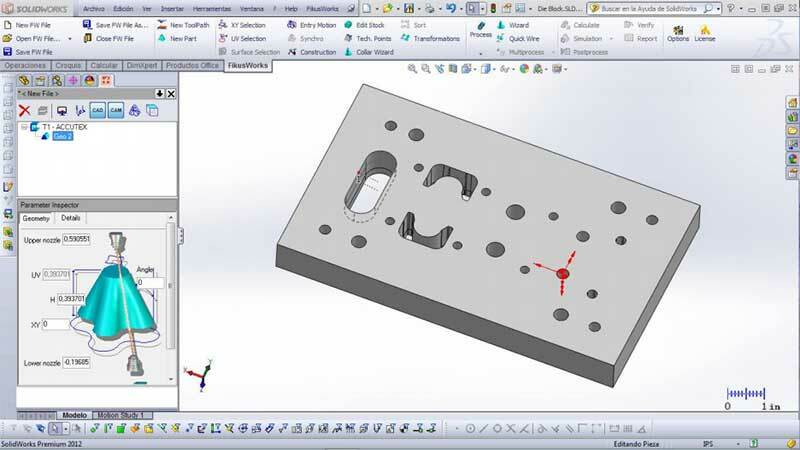 Powerful, easy-to-use SolidWorks 3D CAD solution enable companies to speed up product development, reduce manufacturing costs, and improve product quality and reliability across a wide range of industries and applications. Intuitive product development tools give you the capabilities to create, validate, communicate, and manage your product designs and rapidly bring your products to market. 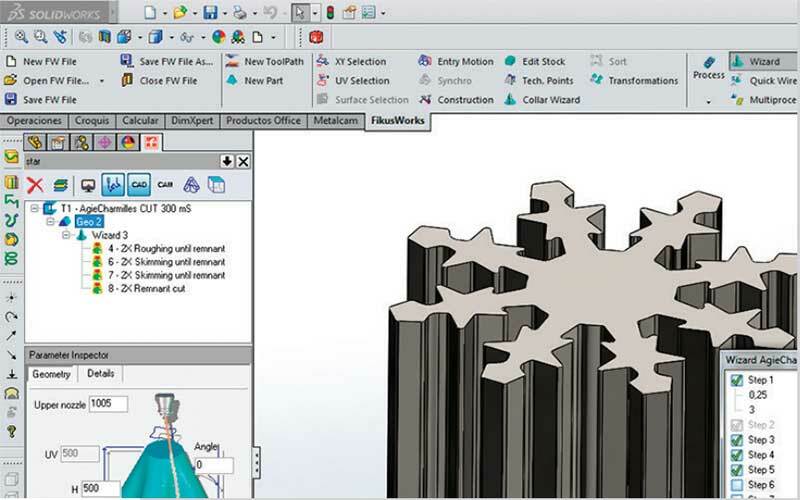 Once you have finished your CAD tasks, you can directly open the FikusWorks tab in the SolidWorks main menu and start to work with the intuitive, easy to use and efficient Fikus CAM solution for wire EDM. All the tools included in FikusWorks are designed for productivity increasing and reduce time-to-market: Specific machine wizards, templates, customizable databases or automatic technological points are there to make your work easier and highly productive. FikusWorks is really easy to use. 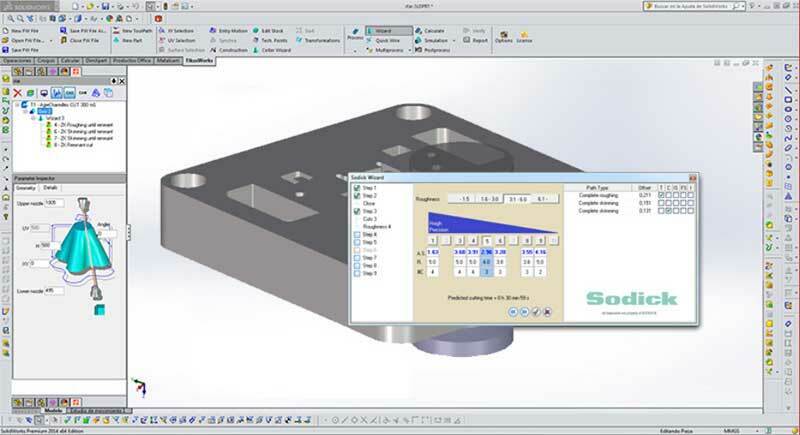 The CAM manager leads the user through the logical sequential process, from defining the geometry and creating the part to cut, to the process definition, calculation and CNC’s program post-processing. FikusWorks is leading innovation in CAD/CAM for wire edm machining because of its acknowledged expertise in controlling this extremely accurate and sophisticated technology. Our close work with the technology leaders put FikusWorks ahead of other cam packages when it comes to get the most out of your wire edm machine. With FikusWorks you can machine any contoured mold, die, core, cavity shape or profile. Control every cutting parameter: offsetting, automatic threading, position of the wire, constant and variable taper, and our latest improvement: Auto-fix, control of the remnant size for a better part disengage. Our Engineers have developed FikusWorks with the objective that the users should go through less and less steps when programming a part. The CAM Manager leads the user through the logical sequential process of the Wire EDM programming, for ultra-precise machining in production shopfloors to high-speed machining in die manufacturing, aerospace medical and other part production industries. Each machine was designed to serve a machining purpose, for that reason, postprocessors must be also specific for those machines. A dedicated Technology Wizard and postprocessor for every specific machine has been developed by our engineers to allow you to output your job ready in just seconds, easily and safely. Fikus will generate the machine optimal cutting strategy for your specific machine and job. 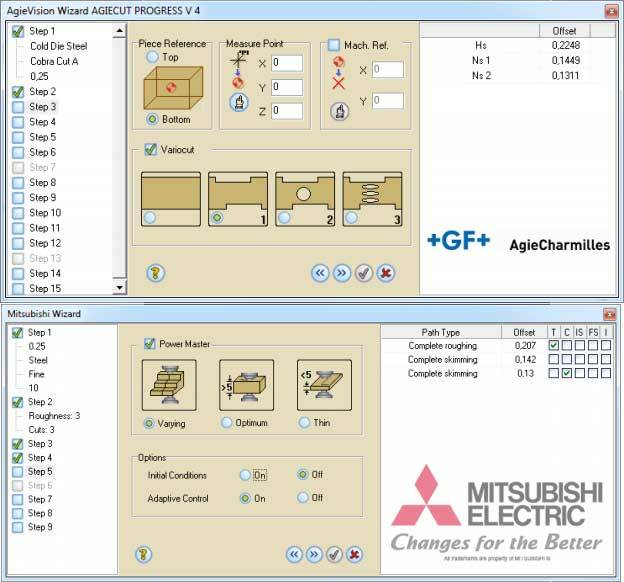 The FikusWorks technological point database allows you to define common operations easily and interactively. The automatic feature recognition can detect all features that must be cut of a part with just a few clicks of your mouse. And if already have defined and tested your best cutting strategy for a part you can save it as a template and use it in the future for other similar parts. You will save time and you will avoid mistakes. Fikus Visualcam includes cutting conditions databases from machines of the main machine makers, new and old. This knowledge will let you automating your programs easily. Fikus for Wire EDM includes "Automatic feature recognition"